I spent my first year as a newbie vegan trying each and every one of the available plant proteins. Beans and tofu weren’t new to me, but the others were. In that year, I had my first bite of tempeh, made my first batch of from-scratch seitan, and played around with TVP. I also tried—and loved—soy curls. In the years since, all of these new and exciting vegan proteins and products have come to life. I feel lucky to be around to see the emergence of delicious vegan sausages, chicken strips, beefy crumbles, artisan cheeses, and more. How cool to be vegan right now, with so many options already and so many more on the horizon. Lately, though, I’ve been getting back to my roots, playing around more often with some of the foods I got to know early in my transition to a plant-based diet. It actually started with revisiting the 10th anniversary edition of Veganomicon; memories of kneading chickpea cutlets came flooding back, though I have to admit I never did a very good job with them. Anyway, I’m being reminded of how wonderfully economical proteins like seitan and TVP and soy curls are, and how versatile. Soy curls have been a particular favorite lately, thanks to Ethan and Michael’s NYC Vegan. 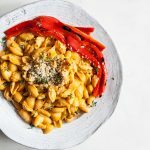 They have a bunch of excellent soy curl recipes, including a very simple vegan one for “chick’n style” soy curls (though I highly recommend their General Tso soy curls, too). I started to play around with it, and I’ve since adjusted it slightly and turned it into a staple at home. There are many, many commercial vegan chick’n options these days, but for me, this one offers me the most bang for my buck: inexpensive, incredibly easy to prepare, and delicious. Thank you, Ethan and Michael! A lot of times I just throw my chick’n style strips into bowls or salads or whatnot, but now that it’s chilly out, and I’m making all sorts of autumnal food, I’ve also been adding them to grain dishes and to soups/stews. 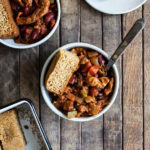 I recently had a hankering for chili, and wondered if I could incorporate soy curls to it (chicken chili was always my preference to beef in the pre-gan days). Once again, inspiration from the vegan community came to my rescue. 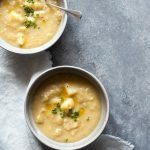 I did a little poking around and found this fabulous recipe by Cadry. I decided to try it with my go-to chick’n soy curls, and I changed the bean/chick’n proportions around a bit. I wasn’t planning to share this one at first—it was just a bout of Saturday night comfort food cooking, guided by culinary friends. But it’s a keeper, and I think it deserves to live here. 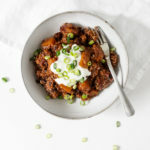 The chili has plenty of smoky flavor from smoked paprika, a touch of heat (which you could make hotter, if you like), and in spite of the fact that it doesn’t have any sweet potatoes—which many of my favorite vegan chilis do—it’s plenty hearty. 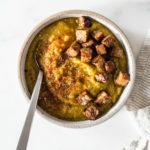 It’s perfect for pairing with some cornbread (I used my go-to, staple whole grain vegan cornbread), or with rice or millet or whatnot. First, prepare the chick'n style soy curls. Place the bouillon in a roomy, heatproof bowl. Bring the water to a boil. Pour it over the bouillon cube, then add the tamari, smoked paprika, and onion powder. Stir everything well, then add the soy curls. Cover the bowl and let it sit for 10 minutes. Drain the hydrated soy curls in a colander, pressing them gently to help remove as much moisture as you can. Store them in an airtight container in the fridge for up to five days. To make the chili, heat the oil in a large pot over medium heat. When the oil is shimmering, add the onion, peppers, and garlic. Cook the vegetables, stirring every minute or so, for 5 minutes, until the onion is soft and clear. Add the chili powder, cumin, paprika, salt, and crushed red pepper. Stir for a minute to combine everything. Then add the soy curls, beans, diced tomatoes, tomato paste, and water. Bring the mixture to a boil, then lower it to a simmer and cover. Simmer for 20 minutes, or until it's thick and bubbly, adding a little more water if needed to loosen the texture. 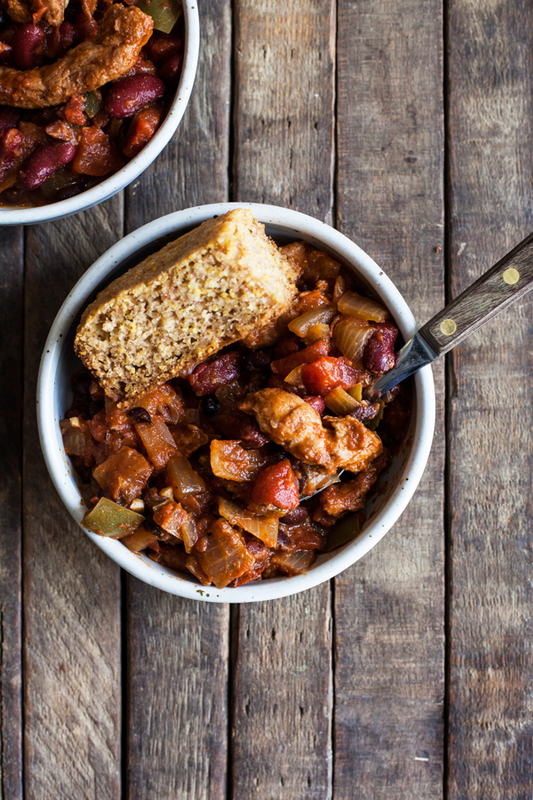 Serve the chili with cornbread or a whole grain of choice. Soy curls can be hydrated simply, with hot water, before they’re added to recipes. Their flavor is very neutral, though, so I tend to have the best results when I season them a little (at least with salt) before stirring them into a dish. I also like to make a double batch of the chick’n style strips all at once, throwing some into a recipe and saving the rest for salad or for homemade vegan chick’n salad sandwiches. If you’re curious about where to find soy curls, you can order them on Amazon or directly from the maker, Butler Foods, which offers some bulk deals and sells other vegan specialty foods. Depending on where you live, you may also be able to find them in health stores or specialty grocers. And it’s worth saying that you can also substitute seasoned tempeh, seitan or another vegan chick’n-style protein in the recipe, too. 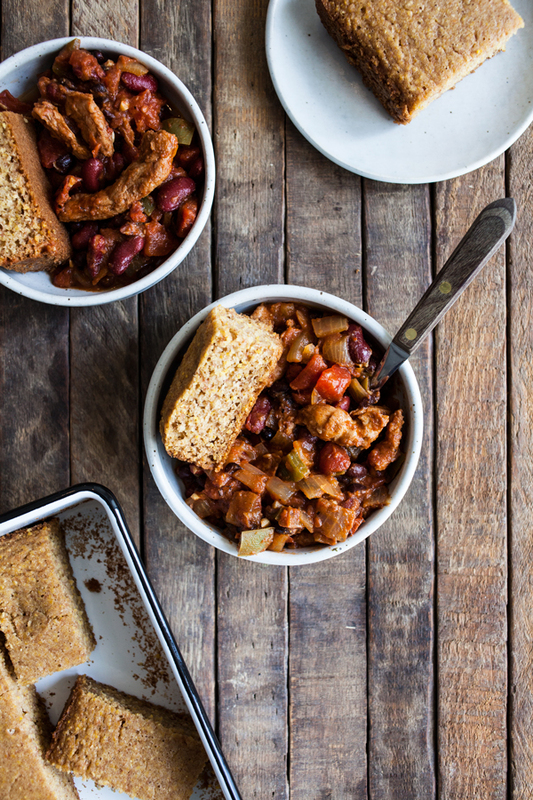 I’ve been having batches of chili and cornbread for lunch since the weekend, and nothing could be more welcome. For whatever reason, I’ve felt a little “off-kilter” this week, and it’s a good time for old-fashioned vegan comfort food. Maybe you need the same, and if you try it, I hope the recipe does the trick. On Friday, I’ll be back to share a healthful, flavorful, and vibrant recipe from Richa’s new book, and I’ll be around on Sunday for the usual roundup. This looks perfect, soy curls are one of my favorites and I don’t buy them enough. Thanks! Oh, this looks so hearty & warming. 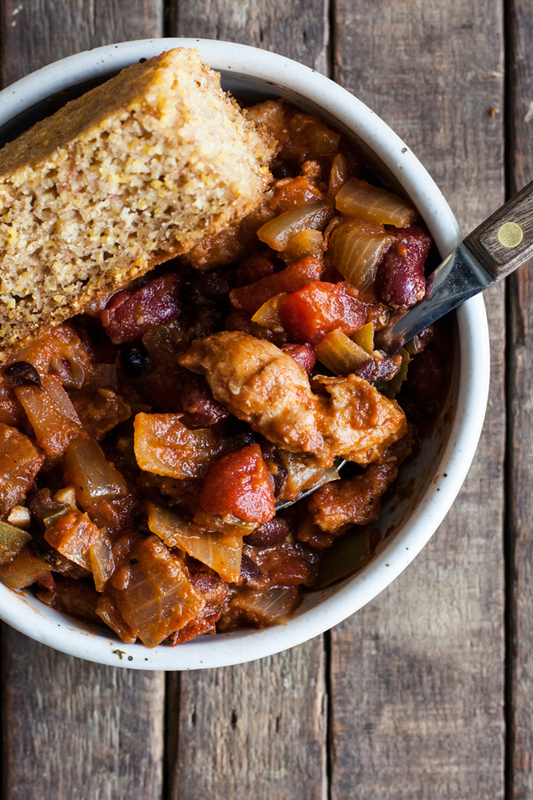 It’s starting to get cooler here, and your chili sounds like the perfect antidote. I’m so glad that my chili could serve some inspiration! Thanks for the love! 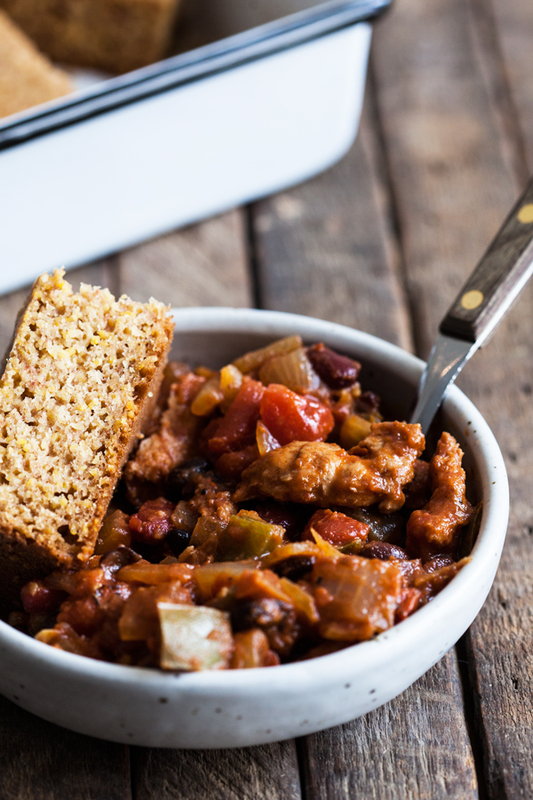 What are your thoughts on vegan processed meat substitutes? I’ve come to rely on them for convenience but worry about the impact on health. We eat things Gardein 3-4 times a week. There’s so much noise about protein isolates that it’s hard for me not to worry! I made this tonight. Great flavor! Thanks.